My last couple days in Brisbane were a lot more relaxing. An evening making tacos and catching up with Sandy, and a day of moving Gina into her new place. Then sadly it was time to say goodbye to everyone. Originally I was meant to go to Noosa. Unfortunately, the cyclone that has been terrorizing Northern Queensland meant that most people were camping out in Noosa until the weather cleared. There was zero accommodation in the town and the cheapest out of town spot was $80/night. Well beyond my backpacker budget. So Surfer’s it was! Surfer’s Paradise is strange. I don’t really know how to describe it. It’s a small town with huge skyscrapers. It’s a long sweeping beach, that stretches as far as the eye can see, and 90% of the water is unswimable due to currents and lack of life guards. The town center is full of cute cafe’s, restaurants, and a million pubs, nightclubs and strip bars. The place is full of characters that put “Walmart People” to shame, and it’s a very popular tourist destination to get rowdy and drunk for as long as you intend to stay. 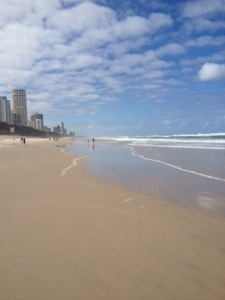 The name “Surfer’s Paradise” is definitely misleading. Yes, you can surf there, but paradise? Maybe not so much. Don’t get me wrong. 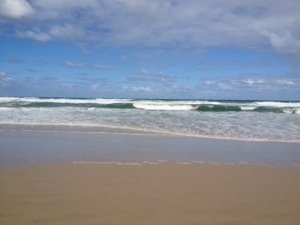 I had a blast in Surfers. I met some crazy new friends, went out on the town, and felt like I was 19 again (aka the average age of everyone in the city). But I’m not sure I could handle the place much longer than that. The hostel that I stayed at had the ins and outs of all the best party spots for every night of the week. Ladies nights offered free drinks from 9 to midnight. Beer pong competitions were held each evening in the courtyard. Happy hour at the hostel bar meant chaos between 6 and 7 each night. The place was madness. On my third evening I desperately needed a quiet night. The night before I had spent galavanting around Surfer’s for nightly specials with a young girl from Amsterdam until well into the morning… Proving to the world that even at 27 I can keep up with the best (Yup, still got it!). But that’s where my “keeping up” ended… Movie night in for me! Sadly, in Surfer’s that’s never the case. Before I knew it I was having a beer and a BBQ with a couple of Welsh guys. 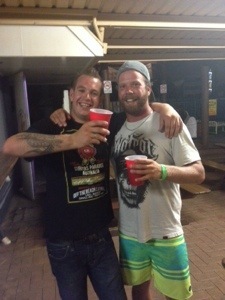 Then I had to prove my Canadianism at beer pong against two insane Kiwi guys and an Aussie. From there a group of us wound up at a place called “Infinity”. It took some convincing to get me to leave the hostel. “I am not going to some sketchy nightclub called infinity with you boys” I exclaimed defiantly. That made no sense to me. But after an even more obscure explanation, they had peaked my interest enough to go. So after quite a walk, splitting up, getting lost, being told the wrong direction 100 times, we ended up at this strange place called infinity. We left as 7 and ended up as 2. Craig and I had lost everyone else, but decided to see what this thing was all about. Turns out it was awesome. I don’t even know how to explain it; it was like a maze with lights and stuff! You had to put on glowing white gloves and walk into total darkness. From there you were moved through an endless maze of strange illusions. A room of mirrors, a hallway that looked like it had no floor, a giant black room that had sparkling lights that we could not, for the life of us, get out of. Of course, I was stuck with the drunkest man on earth. Craig had never played beer pong before, so when he and his friend Jordan asked to join us, we had no idea how serious they would take it. Instead of filling their solo cups only a little full with beer, these crazy Kiwi guys filled their cups to the brim, half with goon and the other half with bourbon and coke. In two games your team should drink the equivalent of 4 beers. These guys had downed 8 cups of goon and 18 cans of bourbon coke… They were absolute disasters. And that my friends, was who I had to help get through a maze of lights and darkness. I swear it took us twice as long to get through the maze: 45 minutes from start to finish. With us being PRETTY certain we were going to end up in the sparkly room until the end of time. But we stumbled out three quarters of an hour later in fits of laughter to find the rest of the boys waiting for us on the other side. From there I split off from the Kiwi’s to have a quieter pint at an Irish Pub down the road with two of the guys. Even that turned into another 3am night in the end. When I woke up in the morning, Craig and Jordan were 12 beers deep between them. They don’t remember getting home, but according to the police report, Craig had been arrested for peeing in public shortly after 3am. “You guys are too much!” I said, exhausted just looking at them. “You boys have fun, I’m off to find somewhere a little more relaxing” Time to get OUT of Surfers! So I hopped on a bus and went to Coolangatta! This entry was posted in Australia by hilarylust. Bookmark the permalink.